Few structures are as synonymous with Ancient Rome as its famed gladiatorial arena, and no trip to the Italian capital would be complete without paying a visit to this iconic locale. 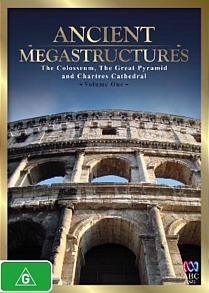 The opening episode of Ancient Megastructures details how 1st century AD architects drained a lake the size of five football fields to make way for the construction of the Colosseum, a public arena that seated 50,000 and had no rivals in scale until the modern age. Eventually 500,000 people and over one million animals were killed in the name of sport during the centuries of the Colosseum’s operation, with several species being driven to the brink of extinction. The story of the funding behind the project is also an interesting one; strapped for cash, Emperor Vespasian ordered the sacking of Jerusalem and had thirty thousand prisoners transported back to Rome to be auctioned off as prisoners, simultaneously lining his coffers and raising enough money to finance the immense undertaking. The only Wonder of the Ancient World still standing, the Great Pyramid of Giza remained the tallest manmade structure on earth for almost four thousand years. Commissioned by the pharaoh Khufu some 2500 years before Christ, its construction represents one of the most miraculous engineering feats in human history. The episode dispels some of the myths surrounding the creation of the Giza pyramid complex, including that it was built by teeming legions of slaves, and also speculates on the final resting place of the mysterious ruler and other aspects of this fascinating epoch. When the original cathedral of Chartres in northern France was destroyed by lightning in 1194, a replacement was hastily commissioned in order to cement the power and prestige of the local religious order. Behind the facade of the immensely beautiful Gothic structure that resulted, however, lies the tale of an intense power struggle between the French aristocracy and the Catholic Church. A wonder of innovation and medieval craftsmanship, the finished cathedral still stands as one of the most stunning churches in all of Europe, its mystique heightened by the intrigue and complications surrounding its construction. This is an excellent series, with strong visuals and a soaring Dolby Digital 2.0 audio track, and all in all Ancient Megastructures provides a polished and enlightening glimpse at the architectural marvels of the past. The re-enactments, narration and overall attention to detail are impressive, and anyone with more than a passing interest in history or engineering will find much to recommend it.